Katie E Davis, Department of Biology & Biochemistry, University of Bath, Bath, UK. Roderic D. M. Page, Institute of Biodiversity, Animal Health and Comparative Medicine College of Medical, Vetinary and Life Sciences University of Glasgow, Glasgow, UK. Our knowledge of the avian tree of life remains uncertain, particularly at deeper levels due to the rapid diversification early in their evolutionary history. They are the most abundant land vertebrate on the planet and have been of great historical interest to systematists. Birds are also economically and ecologically important and as a result are intensively studied, yet despite their importance and interest to humans around 13% of taxa currently on the endangered species list perhaps as a result of human activity. Despite all this no comprehensive phylogeny that includes both extinct and extant species currently exists. Here we present a species-level supertree, constructed using the Matrix Representation with Parsimony method, of Aves containing approximately two thirds of all species from nearly 1000 source phylogenies with a broad taxonomic coverage. The source data for the tree were collected and processed according to a strict protocol to ensure robust and accurate data handling. The resulting tree topology is largely consistent with molecular hypotheses of avian phylogeny. We identify areas that are in broad agreement with current views on avian systematics and also those that require further work. We also highlight the need for leaf-based support measures to enable the identification of rogue taxa in supertrees. This is a first attempt at a supertree of both extinct and extant birds, it is not intended to be utilised in an overhaul of avian systematics or as a basis for taxonomic re-classification but provides a strong basis on which to base further studies on macroevolution, conservation, biodiversity, comparative biology and character evolution, in particular the inclusion of fossils will allow the study of bird evolution and diversification throughout deep time. The class Aves contains an estimated 10,000 extant species occupying almost every geographical location, from ocean to desert. They originated within theropod dinosaurs during the Jurassic period, with the earliest recognised stem group bird being the iconic Archaeopteryx lithographica, of which a number of 150 million year old fossils have been discovered in the famous Solnhofen lagerstätte of Germany. Regular new discoveries, particularly from the vertebrate rich Cretaceous deposits of China, continue to improve our understanding of the earliest birds. Modern birds experienced a rapid radiation early in their evolutionary history, though the timing of this is contentious, resulting in the remarkable diversity that we see today. This rapid radiation of deeper branches is, however, the main confounding factor in our attempts to find the “true” avian tree of life. The analysis found nine MPTs (most parsimonious tree) of length 28834 (additional file 4). Some areas of the tree were poorly resolved with some odd taxon placement, on closer inspection many of these taxa were observed to be those that are poorly constrained within the source trees or poorly represented within the dataset (see discussion) therefore we calculated an agreement subtree. We were unable to calculate a Maximum Agreement Subtree in PAUP* 4.0b10 due to memory limitations so we used the Approximate Agreement Subtree function in TNT. This function uses a heuristic that accurately obtains an agreement subtree but does not guarantee to find the one with the greatest number of taxa (i.e. the MAST). The agreement subtree contained 5380 taxa and the resolution was greatly improved. Figure 1 shows the whole supertree with higher taxa indicated. This figure gives an indication of the size of the tree and the relative sizes of clades. For a simplified order-level tree see Figure 2. For an electronic version in which the whole tree can be viewed in detail see additional file 5. Agreement subtree calculated for nine MPTs of length 28834.The resulting supertree contains approximately two thirds of all known birds synthesised from source data from the years 1976 to 2008. Simplified summary supertree showing order-level relationships. The tree is well-resolved and stable at both order and family level with the majority of families and orders resolved as monophyletic; see discussion below for exceptions. The extinct Mesozoic birds are placed at the base of the tree with Archaeopteryx lithographica occupying the most basal position. Within these the Enantiornithes (“opposite birds”) form a distinct monophyletic clade. The Enantiornithes represent a separate radiation to the Ornithurae (the direct ancestors of modern birds) that subsequently became extinct at the Cretaceous-Tertiary boundary. The earliest divergences of birds are amongst the least controversial and here the supertree supports the split of the crown group modern birds (Neornithes) into Palaeognathae + Neognathae with a further spilt of Neognathae into the Galloanserae landfowl/waterfowl clade + all other modern birds (Neoaves) as opposed to Sibley and Ahlquist’s non-monophyletic Neognathae in which the Galloanserae are sister group to the Palaeognathae. The extinct Tertiary palaeognaths Lithornis and Palaeotis are basal to the extant palaeognath taxa. The supertree supports the hypothesis of Tinamidae + all other palaeognaths. The extinct Madagascan elephant bird Aepyornis appears within the Struthioniformes at the base of the Struthionidae + Rheidae while the Dinornithidae of New Zealand appear at the base of the Struthioniformes clade. The New Zealand ratites, Apterygidae and Dinornithidae, do not form a monophyletic group. This has been suggested by Houde and Cooper et al. to have implications for vicariance biogeography providing evidence for a second colonisation of New Zealand by kiwis. The Galliformes + Anseriformes clade is well-supported by molecular works. Within the Galliformes, the supertree supports the more recent view of Megapodidae as sister to the Cracidae + remaining Galliformes, which all constitute monophyletic families rather than the more traditional placement of a Megapodidae + Cracidae clade as sister to the rest of the Galliformes. The Anseriformes are split into the three well-defined traditional, monophyletic families: Anhimidae, Anseranatidae and Anatidae. The supertree recovers the “waterbird” clade containing the “Pelecaniformes”, “Ciconiiformes”, Procellariiformes, Sphenisciformes and Gaviiformes as found in the large molecular analyses of Ericson et al. and Hackett et al. Morphological evidence also supports this clade. The Livezey and Zusi phylogeny also places the orders Phoenicopteriformes, Podicipediformes and Phaethontiformes within this assemblage, as can be seen in the supertree. Within this assemblage the traditional “Pelecaniformes” are split into two groups, one comprising the Pelecanidae, the other the Fregatidae + Sulidae + Anhingidae + Phalacrocoracidae. In addition the Pelecanidae are grouped with the “ciconiiform” families Ardeidae, Balaenicipitidae and Scopidae. These findings are consistent with recent molecular studies in which it is proposed that the “Pelecanidae” group retains the name Pelecaniformes while the second group be given the name “Phalacrocoraciiformes”. Some analyses also place Threskiornithidae with the Pelecaniformes which would result in only the Ciconiidae remaining in the Ciconiiformes. The placement here of Threskiornithidae + Ciconiidae may simply reflect the recent state of flux of these taxa. The sister group relationship of Sphenisciformes + Procellariiformes has support from both morphology and molecular data. There is limited evidence for the placing of Gaviiformes with these taxa but the relative positions of all three orders within the “waterbird” assemblage is far from resolved. There are a number of well-known fossil penguins (e.g., Delphinornis, Marambiornis, Perudyptes) which are all placed basally within the Sphenisciformes in the supertree. The Procellariiformes consist of well established monophyletic families. The Phoenicopteriformes + Podicipediformes clade found by the supertree, termed “Mirandornithes” by Sangster, is well supported by a large number of molecular studies. The positioning of the Gruiformes + Otidae and the Charadriiformes (including the Turnicidae) as sister groups to the “waterbird” assemblage is congruent with recent molecular hypotheses. The Turnicidae were traditionally placed in the Gruiformes but are now understand to be part of the Charadriiformes. It is less certain that the Cariamidae are genuinely part of the Gruiformes + Otididae clade. The Cariamidae were also part of the traditional “Gruiformes” but may actually be more closely related to the falconiform birds. The core Gruiformes found here are composed of the Psophidae, Gruidae, Heliornithidae, Aramidae and Rallidae. Within the Charadriiformes the most basal lineages include the plovers and allies; Chionidiae, Burhinidae, Pluvianidae, Recurvirostridae, Ibidorhynchidae, Haematopidae and Charadriidae. The supertree divides the remaining Charadriiformes into monophyletic gull and sandpiper lineages. Eurypygidae + Rhynchochetidae is well supported by morphological and molecular data. The Columbidae + Pteroclididae is less certain but relatively well established. The position of these taxa with the Mesitornithidae as part of the “Metaves” is suggested by recent molecular studies. The supertree however does not support the “Metaves” clade and it has been suggested that the “Metaves” does not constitute a monophyletic group as discussed in Mayr. The results found here are more congruent with Chojnowski et al.’s findings of an affinity between Columbiformes and the core Gruiformes + “waterbird” assemblage. The supertree places the extinct Raphidae (dodo and solitaire) within the Columbiformes. The relationships of the hoatzin are controversial and poorly understood. Opisthocomus has previously been placed with the Cuculiformes (cuckoos, coucals and anis), the Gruiformes (crakes and rails) and Musophagiformes. The supertree supports the Opisthocomus + Musophagiformes relationship. Other putative close relatives include the Columbiformes but the supertree does not recover this relationship. Mayr coined the term “Strisores” for the clade containing Caprimulgiformes and Apodiformes that has received a great deal of support from molecular data. The supertree supports the monophyly of this proposed clade and places it as sister to the “landbird” assemblage as in Pratt et al. 2009; rather than as part of the “Metaves” as proposed elsewhere or as a polyphyletic group. The sister group relationship of the “caprimulgiform” taxon Aegothelidae and the Apodiformes, resulting in a paraphlyletic “Caprimulgiformes” is well-supported by molecular and morphological data. The Apodiformes contain a monophyletic Apodidae and Trochilidae, as in Sibley and Ahlquist’s “Trochiliformes” for hummingbird taxa. The association between the Apodiformes and “Trochiliformes” has long been recognised and is not contradicted by any of the source trees. The Falconiformes and Accipitriformes represent a single lineage in the supertree. The Falconiformes and Strigiformes are united as in analyses based on osteology. They are not however placed within the “landbird” assemblage as in recent large molecular studies. New World vultures (Cathartidae) are not placed with the Ciconiiformes as in some early works but neither are they placed with the Old World Vultures (Accipitriformes) supporting the proposal that they might require an order level designation (“Cathartiformes”). Recent large molecular analyses have proposed a “landbird” clade, the supertree recovers part of this clade but not in its entirety. 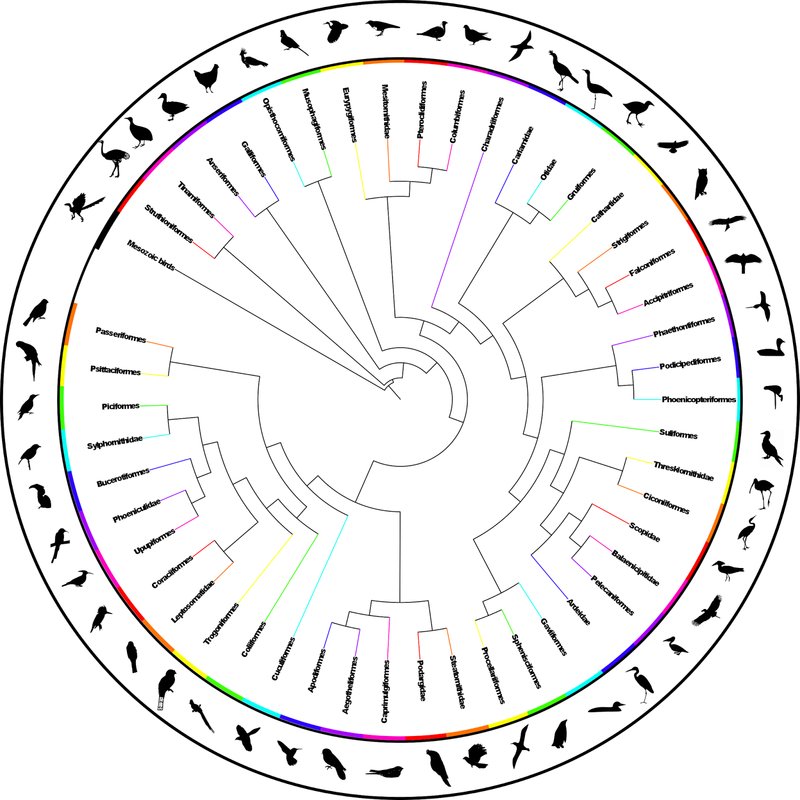 The supertree does support a monophyletic clade containing the Coraciiformes, Alcediniformes and Piciformes which is well supported by molecular data. The affinities of the Leptosomatidae are not well-understood, the supertree places them within this “landbird” assemblage with the Coraciiformes. The Trogoniformes are a taxon for which higher level relationships are poorly understood, in the supertree they are placed as sister to the Coraciiformes + Alcediniformes + Piciformes clade with the Coliiformes and Cuculiformes also placed in this clade. The former is supported by molecular data, however the latter is not well-supported. The Piciformes are split into two distinct clades, one supporting the division into the monophyletic families Ramphastidae, Capitonidae, Megalaimidae (previously included within Capitonidae), Lybiidae and Semnornithidae and the second containing the monophyletic Picidae (woodpeckers) and the Indicatoridae (honeyguides) as in Simpson and Cracraft, Swiersczewski and Raikow and Lanyon and Zink. The coraciiform clade contains the Brachypteraciidae, Coraciidae, Meropidae, Alcedinidae, Todidae and Momotidae. The Bucerotiformes, Bucorvidae, Bucerotidae and Phoeniculidae, are placed in a clade sister to the Piciformes. The Hoopoe, Upupa epops, is also placed within the Bucerotiformes in contrast to Sibley and Ahlquist’s suggestion of elevating it to a new order “Upupiformes”. The Psittaciformes are traditionally considered to have no close living relatives but the supertree is consistent with more recent analyses that place them as the sister taxon to the Passeriformes. The Passeriformes contain the majority of extant bird species and have undergone extensive reorganisation within the last decade. The supertree supports the division into three suborders: New Zealand Wrens (Acanthisitti) + all other passeriformes (Tyranni + Passeri). Monophyly of the Old and New World suboscines is well-documented and as expected the supertree splits the Tyranni (suboscines) into Old World (Eurylaimides) and New World (Tyrannides) groups, all of which contain well-established monophyletic families, the one exception being the Eurylaimidae which is now understood to be polyphletic. In the supertree Smithornis and Calpytomena fall outwith the main Eurylaimidae clade. The neotropical Sapayoaaenigma was traditionally placed in the New World suboscines but has more recently been placed in the Old World suboscines in varying positions; the supertree places it at the base of the main Eurylaimidae clade (containing Eurylaimus). The New World suboscines are further split into two monophyletic superfamilies; the “bronchophone” suboscines and the Furnarioidea. The Oligocene fossils Zygodactylus andPrimozygodactylus danielsi are placed at the base of the Passeriformes. Sibley and Ahlquist split the Passeri into the Corvida and the Passerida but while the Passerida is retained it is now known that the “Corvida” do not comprise a monophyletic group. Basal within the Passeri are the Menuridae and Atrichornithidae, sometimes designated as the superfamily Menuroidea. The supertree also supports the superfamily status of the previously incertae sedis Ptilonorhynchoidea (Climacteridae + Ptilonorhynchidae), and supports a relationship between Orthonychidae + Pomatostomidae. The Meliphagoidea contains a monophyletic Maluridae, Pardalotidae, Acanthizidae and Meliphagidae. The large well-supported superfamily Corvoidea includes the corvid birds that have radiated out from the Australo-Papuan region and diversified worldwide. As found in the previously published oscine supertree Melanocharis and Paramythia berrypeckers, and Toxorhamphus longbills appear to belong to Corvoidea rather than to Passeroidea as suggested by Sibley and Ahlquist and Monroe and Sibley. Other lineages placed within this clade include well-established members of the core Corvoidea. These include the Campephagidae, Paradisaeidae, Monarchidae, Oriolidae, Dicuridae, Laniidae and Corvidae. The Picarthatidae + Chaetopidae + Eupetidae clade (possible superfamily) and Petroicidae are at the base of the large infraorder Passerida. This placing of the Petroicidae reflects recent views on their position within the oscine birds. 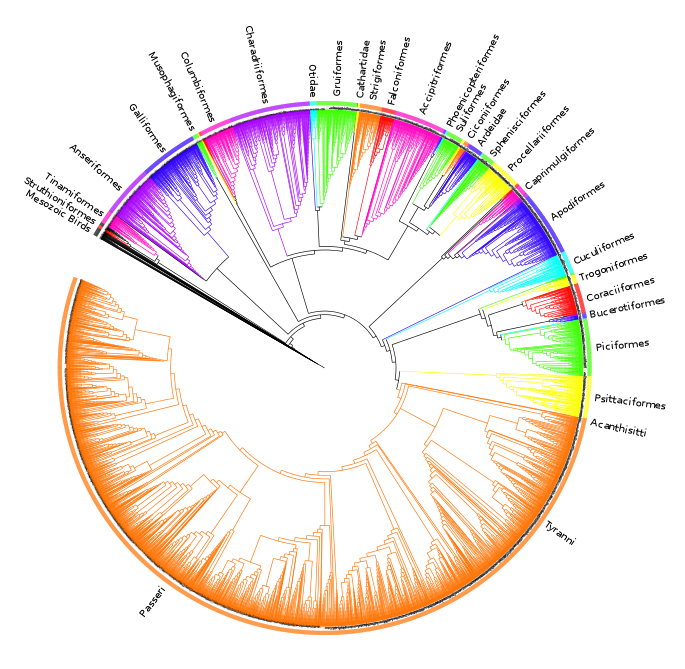 The supertree supports the identification of a number of recently proposed superfamilies within the monophyletic Passerida clade in addition to Sibley and Ahlquist’s original three: Sylvioidea, Muscicapoidea and Passeroidea. At the base of the Passerida are the Sylvioidea and the possible superfamily Paroidea. The Hyliotidae have recently been split from Sylviidae and are placed as sister to the Sylvioidea in the supertree. The Sylvioidea families have undergone a great deal of change in recent years, the supertree supports many of the newly suggested families and new delimitation of traditional families, for example the splitting of the “Timaliidae” into a core timaliid clade and a number of newly recognised lineages such as the Pellorneidae and Leiothrichidae and the splitting of the “Sylviidae” to recognise new families such as the Locustellidae and the Cisticoliidae. Well-supported members of the Sylvioidea include Alaudidae, Hirundinidae, and Pycnonotidae, while the supertree supports the inclusion of the Zosteropidae within the Timaliidae. The Muscicapidoidea and Certhioidea form a clade with the proposed Bombycilloidea and Reguloidea superfamilies. Muscicapoidea intra-relationships are well-supported by a number of analyses and the supertree finds the traditional families Mimidae, Cinclidae, Sturnidae, Turdidae and Muscicapidae along with the Buphagidae and Rhabbdornithidae also being placed as distinct families. The Passeroidea is the largest passeriform superfamily. Along with finches, sparrows, weavers etc. it contains the nine-primaried oscines – songbirds with nine easily identifiable primary feathers on each wing. The nine-primaried oscines are a large radiation that contains approximately 10% of all extant species of birds and form a strongly supported monophyletic clade. The supertree does not place the Peucedramidae within the nine-primaried oscines but with the Prunellidae. All the families are resolved as monophyletic with the exception of the Thraupidae/Cardinalidae clade which has undergone extensive reorganisation in recent years. The supertree was unable to resolve the position of the Icteridae, the varying position of the Icteridae in the supertree as sister to either the Parulidae or the Emberizidae both have support from recent analyses. In the simplified family level tree we have collapsed these three families to a trichotomy to reflect this uncertainty, which seems likely to be a reflection of its varying position in source trees rather than a true biological relationship. The supertree supports the separation of the estrildid finches and the true sparrows into two families the Estrildidae and Passeridae as in Christidis and Boles. The Dicaeoidea (Nectariniidae + Dicaeidae) and Promeropidae are at the base of the Passeroidea. These may represent independent superfamilies or may be included as part of the Passeroidea. The supertree is the first published species-level supertree of birds. It is also the first comprehensive phylogeny of birds to include fossils; both recently extinct and Mesozoic taxa, which are of vital importance for analyses requiring an understanding of the deep evolutionary history of birds. It is not intended to be the final word in avian systematics nor is it intended to be used as a basis for re-evaluating avian taxonomy. It does, however, provide a platform upon which further research can be based and will hopefully provide a useful resource for researchers studying avian macroevolution, conservation, biodiversity, comparative biology and character evolution. An earlier version of the supertree has already been used in a large number and variety of evolutionary studies and it is anticipated that this updated tree will provide a basis for further research of this nature and may be of particular use to macroevolutionary studies due to the inclusion of fossil taxa. We acknowledge that many additional papers have been published since our data collection ceased – avian systematics is a rapidly moving field. This tree does however represent a significant update compared to Davis and we anticipate that a further update will be published in the future; for now this tree is still the only large avian phylogeny available with a broad taxonomic coverage containing both fossil and extant taxa. This work highlights areas in which systematic knowledge is poor or inconsistent, suggesting a possible focus for future phylogenetic studies. We also identify the need for leaf-based measures of support to aid identification of rogue taxa in supertree analyses. The supertree represents a first attempt at a species-level avian supertree and will no doubt be improved upon as further data and better algorithms become available.